There are two keys to this tasty egg dish: first, using the green parts of the leeks and then cooking them long enough to make them tender, and second, using plenty of fresh, vibrant spring herbs. Any single herb is good, of course, but a mix of chervil, dill, a bit of mint, and parsley is my favorite. 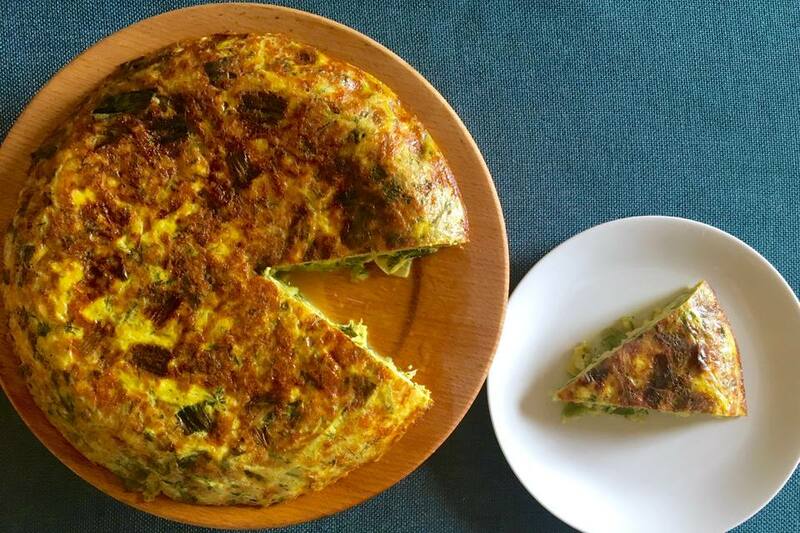 Serve this frittata for brunch with a side of bacon and some fresh pastries or as a simple supper with a green salad and crusty bread. Best of all, you can cook it ahead and serve it at room temperature, making it ideal for a brunch buffet (did anyone else think "Easter brunch"?) or a busy night with different dinner times. Trim the leeks, cut them in half lengthwise, and thinly slice. Go ahead and use the darker green parts as long as they aren't dried out. Put the leeks in a colander and rinse under cold running water to remove any dirt or grit. In a large frying pan over medium heat, melt the butter. Add the leeks, including any water clinging to them, and add 1/2 teaspoon of the salt. Cook, covered, stirring now and again, until the leeks are very tender, 20 to 30 minutes. Meanwhile, peel and grate the potato into a medium saucepan, cover with water and the remaining 1/2 teaspoon salt. Bring to a boil over high heat. Adjust the heat to maintain a steady simmer and cook until the potato is just tender, about 5 minutes. Drain and rinse with cold water to cool off. Working in a small handful at a time, squeeze the potato dry. Put the eggs in a large bowl and whisk until completely blended. Add the potatoes, leeks, and herbs. Stir to combine. Heat an oven-safe 10-inch frying pan over medium-high heat. Coat with spray oil. Pour in the frittata mixture, using a spoon or spatula to even out the top. Cook for a few minutes until the edges are set. Reduce the heat to low and cook until the frittata is set except just in the center. Heat a broiler and slip the pan under it. Cook until the top of the frittata is set and starting to brown. Turn the frittata out onto a serving platter. Let cool slightly, slice, and serve warm or at room temperature (leftovers are pretty darn good cold, too! ).